Abortion rights groups and lawyers who support them are gearing up for a court challenge against new Arkansas regulations that they say would, in part, ban a common abortion procedure and would require women to notify and get consent from their sexual partners or relatives before getting abortions. Four measures set to go into effect later this month and early next year would place "severe and unwarranted burdens" on women's access to abortions, the American Civil Liberties Union said in a statement after the the lawsuit was filed. "With this package of laws, we're definitely seeing a new, creative and especially cruel attempt by Arkansas to make abortion more difficult, if not impossible for women to access — and to stigmatize and demean them in the meantime," Hillary Schneller, a staff attorney for the Center for Reproductive Rights, told NBC News. The challenge will play out in court on Thursday as the ACLU, the ACLU of Arkansas and the Center for Reproductive Rights will have a hearing for the federal lawsuit, which they filed last month. Brigitte Amiri, a senior staff attorney for the ACLU, told NBC News that the groups are seeking an emergency order preventing the state from enforcing the laws during the case. One of the new laws would essentially bar a "safe and medically proven" common abortion method used during the second trimester of pregnancy, known as dilation and evacuation, Amiri said. Schneller added that this "would essentially end access to second-trimester abortions in Arkansas," because the method accounts for nearly all second-semester abortions reported in the state. State Rep. Andy Mayberry, who sponsored the bill, told NBC News that it wasn't aimed "at preventing abortions" or stopping abortions during the second trimester. "What we're trying to do here is prevent one particularly gruesome, barbaric procedure from taking place," he said. Mayberry added that he believed the bill was "written in such a fashion that I believe will withstand judicial scrutiny." He pointed to similar measures in other states, such as West Virginia and Mississippi, and a U.S. Supreme Court decision in 2007 to uphold a ban on a controversial abortion procedure known medically as intact dilation and evacuation. Another of the laws being challenged in Arkansas would require women to notify and get consent from their sexual partners or family members on how to dispose of fetal tissue before they can have abortions, according to the lawsuit. The recently passed H.B. 1566 adds "a dead fetus" to the Arkansas Final Disposition Rights Act of 2009, which states that family members have to agree on what happens to a body after a person's death. Schneller said that, in essence, would "require that a physician performing an abortion notify a woman's sexual partner, or parent if she's a minor, of their right to participate in the disposition of tissue from an abortion." 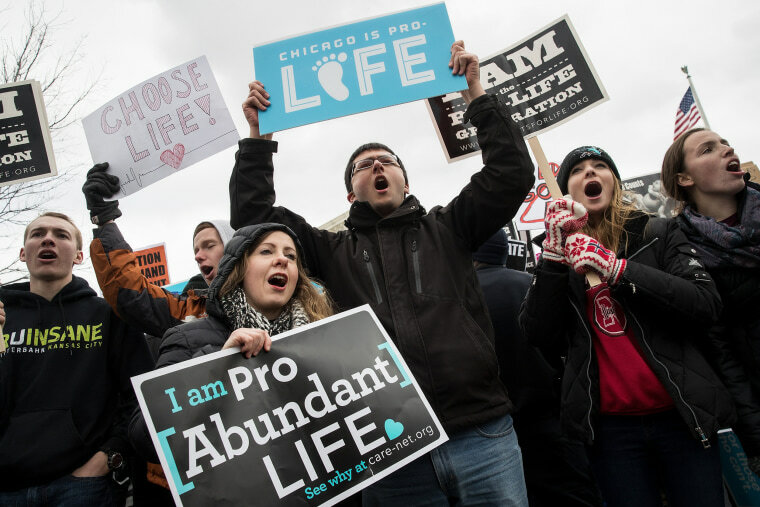 Feb. 11: Dueling Protests Over Abortion Access Erupt Across U.S.
"As a practical matter, the health provider can't begin performing an abortion without knowing the tissue can be disposed of lawfully," she added. "That shows this notification really has to happen before any care can be provided, and that can create incredible delays — and abortion is a time-sensitive procedure." The bill's main sponsor, Republican Rep. Kim Hammer, defended the measure to the online publication Bustle last week, saying, "He was there at conception so he ought to be there through the whole process." "I think that all life, from conception through birth and right up through death by natural causes, needs to be treated with dignity, respect, and also a unified approach to deal with the remains," he added. The two other laws require doctors who perform abortions on minors to preserve fetal tissue in case local law enforcement should need it as evidence, according to the lawsuit, and to amass a number of additional medical records before performing the procedure. Planned Parenthood Great Plains and Little Rock Family Planning Services have filed a separate challenge against a law in the state that would allow the closing of abortion clinics found in violation of any state law, regardless of how minor. The Republican-controlled Legislature has put forth a series of abortion restrictions every year for the last few years, said Elizabeth Nash, senior state issues manager at the Guttmacher Institute, a reproductive heath and rights organization. "This Legislature has become extremely hostile to abortion rights," she said. Nash added that according to the institute's data, Arkansas ranked as a "middle-ground" state in 2000 in terms of its abortion restrictions, with only three of 10 major restrictions in place. But as of 2016, the state ranked in the highest category of "extremely hostile," with eight of 10 major types of restrictions in place. "Arkansas right now is one of the top 10 most restrictive states when it comes to abortion rights," she said. As of 2016, 22 states had six or more abortion restrictions, prompting the Guttmacher Institute to characterize them as "extremely hostile to abortion rights," she said. And while organizations tracking abortion restrictions, such as the Guttmacher Institute, have seen states try to enact legislation like the ban on dilation and evacuation, some of Arkansas' latest restrictions "are pretty unusual," Nash said. H.B. 1566, the law that advocates say would require notification of woman's sexual partners before an abortion, is new and potentially highly problematic, she said. "When a woman is seeking an abortion, it may not be in her best interest for the partner to know about that, and it could be very detrimental to her in some cases," she said. "This is a completely different way [of] addressing the issue of fetal disposal than we've seen in any other state." Amiri said Arkansas was not the only state to "add restriction upon restriction" in the last few years. "Since 2010, lawmakers have passed over 300 abortion restrictions throughout the country," she said. Abortion rights advocates were victorious at the federal level in June 2016, when the the Supreme Court struck down one of the nation's toughest restrictions on abortion, a Texas law passed in 2013 that would have caused more than 75 percent of the state's clinics to shut down. But Nash said that with much of the nation's focus on issues at the federal level following the presidential election, some more recent abortion restrictions at the state level were getting lost in the noise. "We are still seeing a very large number of restrictions moving through state legislatures in 2017, and I think some of that gets lost with all of the focus at the federal level," she said.